Our unique, smart cloud technology scans fast and secures your online identity and financial information without interrupting or slowing down your online experience. 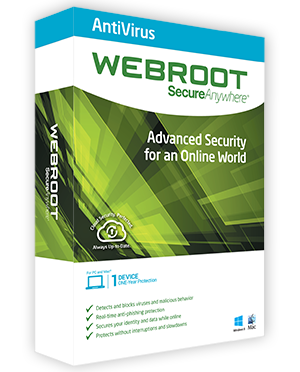 Our proprietary Webroot Intelligence Threat Network is continuously fed with advanced threat data from over 30 million worldwide users. Lightning-fast scans, with no interruptions, so you and your device won’t be slowed down. Proactively checks websites for malicious content and blocks fake sites that trick you into entering personal information. Voted Best Security Software from PC Magazine for the 16th year. U.S. owned company offers award winning customer support from our Colorado based support team. Supports up to 3 PC or Mac devices. Windows 10 Compatible. For best performance, please update to the latest version.